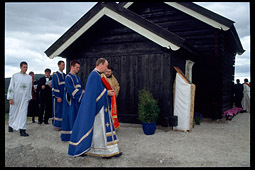 was opened in the barn. 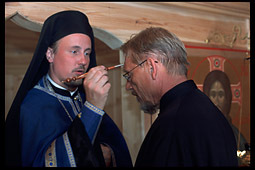 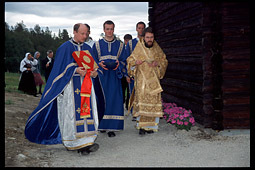 The consecration took place on June 2728, 2003. 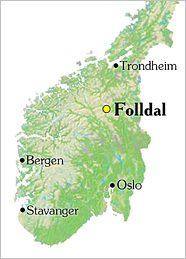 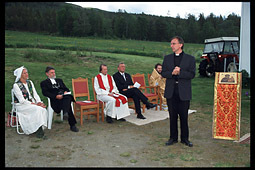 Guests from all corners of Norway and from abroad arrived. 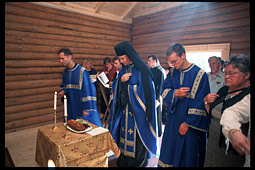 In the evening of 27th June, Vespers was celebrated in the chapel. 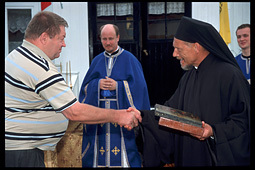 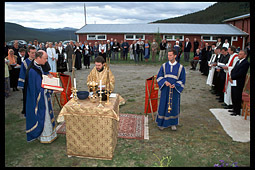 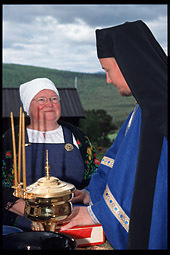 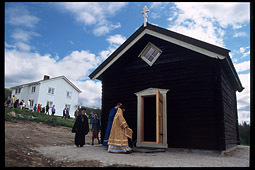 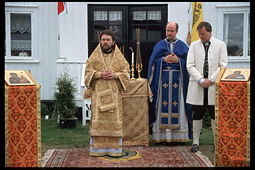 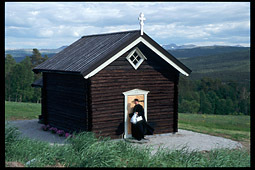 On the 28th of June, Bishop Hilarion of Vienna and Austria arrived to Steinhaugen farm to consecrate the chapel. 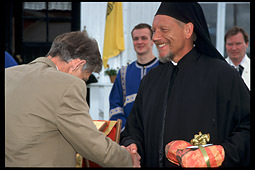 At his arrival, the faithful got his blessing. 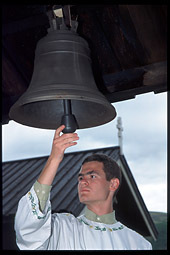 The bell is ringing at the beginning of the service. 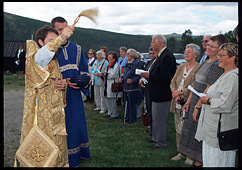 Bishop Hilarion celebrates the Lesser Blessing of waters and consecrates the chapel. 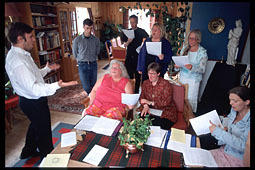 Guests, officials and many local folks are attending the ceremony (and so are newspaper, radio and TV reporters). 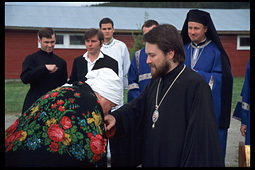 After the consecration, speeches are given and presents passed to monk Jonah. 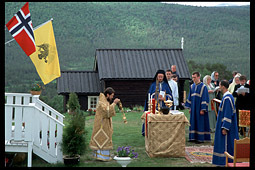 Following the consecration and addresses, Bishop Hilarion leads everyone to the first Divine Liturgy in the chapel. 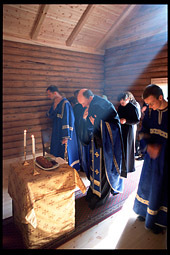 the Liturgy lasted two hours. 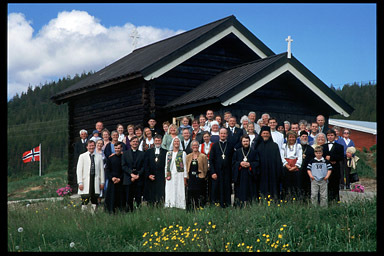 At the end of the feast at Steinhaugen farm, everyone gathers for a group picture. 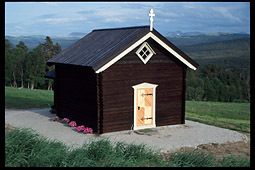 See also: Official page of the chapel (in Norwegian or Russian). 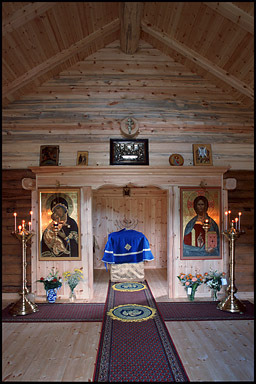 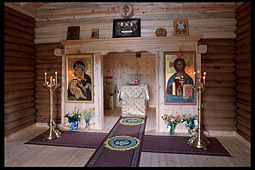 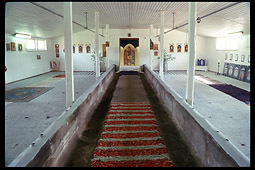 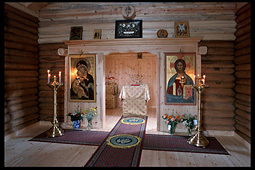 Some of the above pictures decorate the rooms in the Christ the Savior Orthodox church in Oslo. 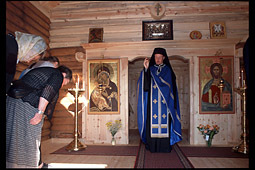 Vadim Makarov; bilingual image captions by Fr. 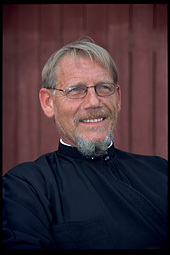 Clement. 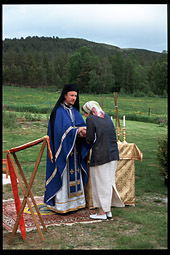 I thank Russian Orthodox Church in Norway for invitation to shoot the event. 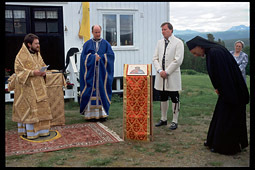 Note from 2006: Ive since figured out religion and become an atheist  VM.